You may have heard of about the sword in the rock, and surely think about the legend of King Arthur, Excalibur and the round table. The sword in the rock actually exists, in Tuscany! 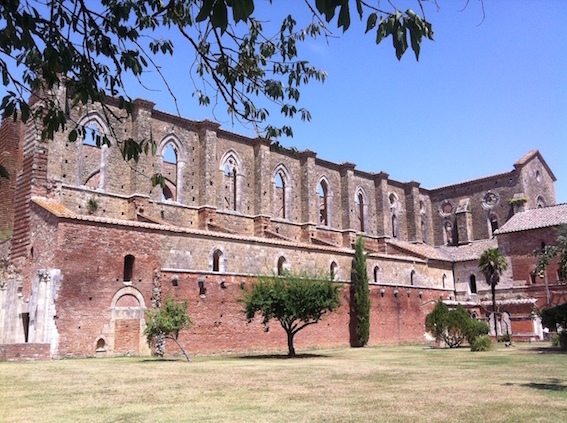 There is a beautiful 12th century abbey called San Galgano, situated in the area between Siena and Grosseto, nearby the small town of Chiusdino. 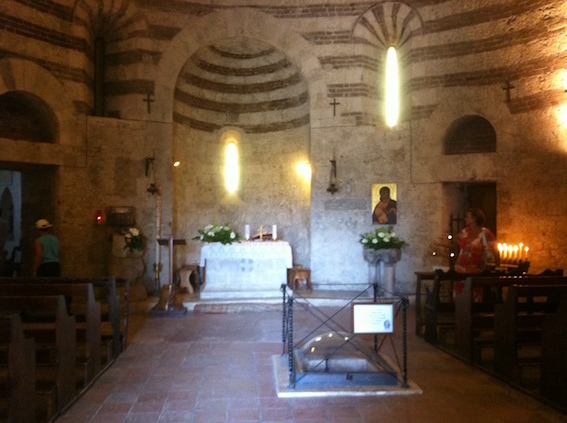 The sword is kept inside a small Eremo of Montesiepi, a gorgeous chapel from 12th century. The legend tells, that in 1148, the archangel Gabriel appeared to a local nobleman Galgano Giudotti, who took his horse and escaped to the mountain of Montesiepi, hit the sword into the stone to create a cross and a place to pray. 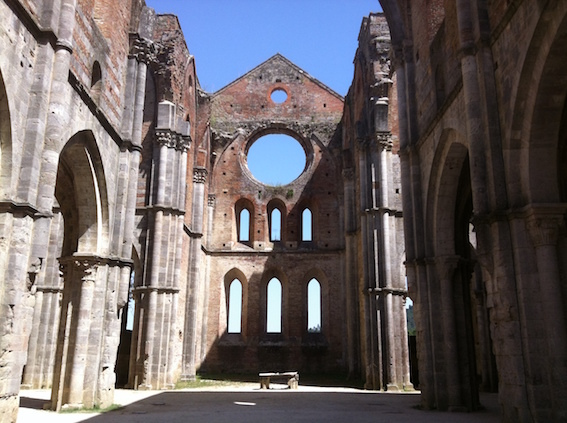 This miraculous happening became a sensation, and many pilgrims traveled to meet Galgano until his death 1181. He was canonised by the catholic church as a saint San Galgano in 1185. 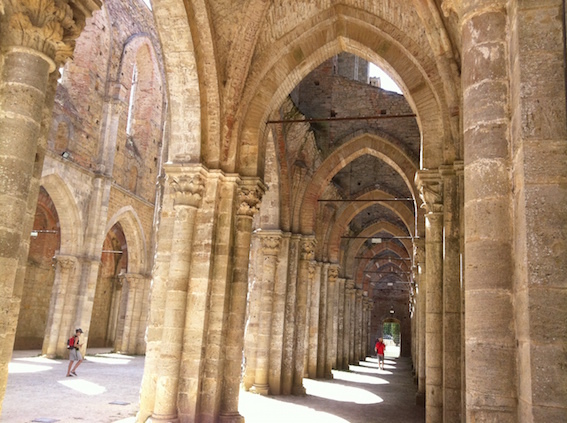 It was in his order the Montesiepi chapel and later on the Abbey of San Galgano were built. This is the legendary story of the sword in the rock. There is up to day no reliable documentation of the origins of the sword, and the secret of the sword is currently kept inside the fascinating round walls of the Montesiepi chapel. But the story raises an interesting literary question; Is the story of King Arthur and Excalibur originally Tuscan, that was perhaps later verbally told in other countries and arrived to England that way? 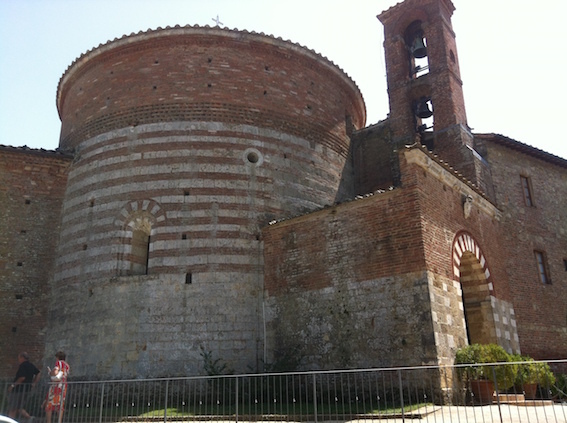 The small Chapel of Montesiepi is a very special building, with domed roof, decorated with 24 circles, altering white natural stone and Tuscan terracotta, that creates a beautiful, neo-etruscan space, reminding also of the Greek architecture. The chapel of Montesiepi is a beautiful example of romanesque gothic cistercian architecture. 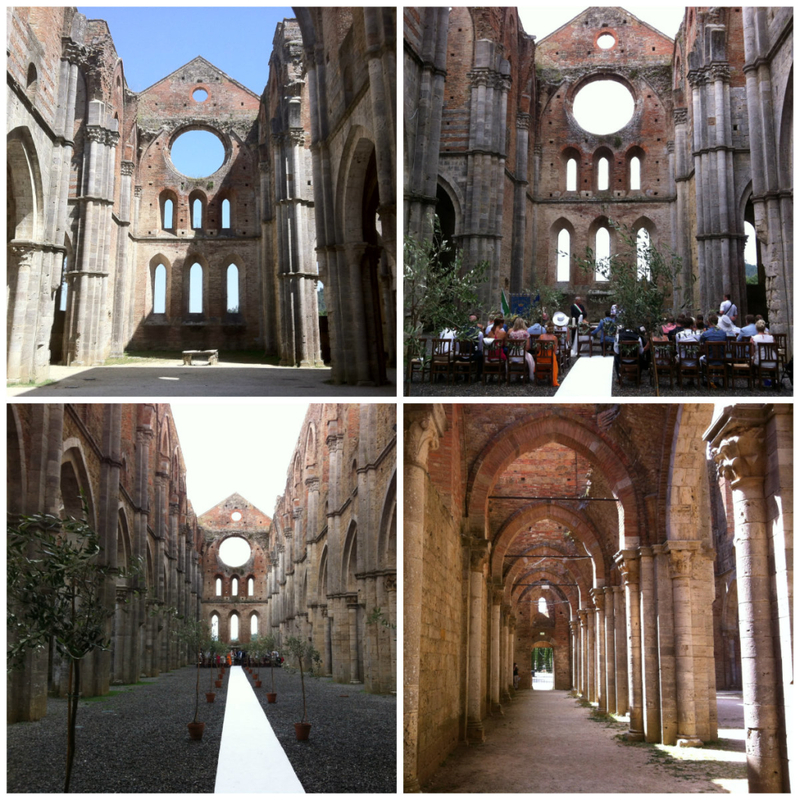 Just few hundred meters from the chapel there is the famous Abbey of San Galgano, a roofless church and an amazing monument. 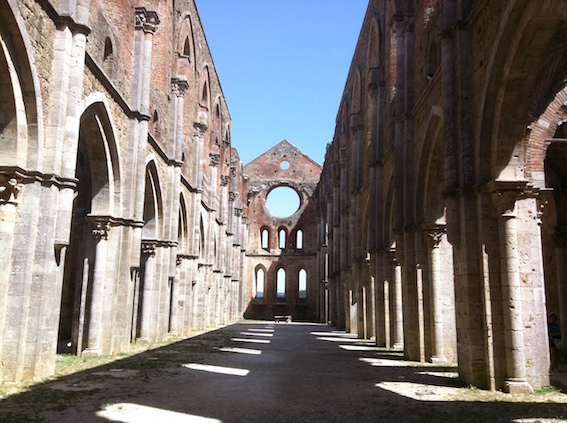 Also the abbey was built in 12th century, named after the Saint of Galgano. It was raised in the wealthy period of Siena, and left to fall when Siena ended in conflict with the papal state. With time the cathedral became a sort of a cave for building material. The roof fell in 17th century leaving the church as a mystic ruin. The gothic shapes of the walls and the open roof create a magnificent view, that makes you think you are back in the medieval times, or in a film set. In fact the location has been used as a set in many famous films, among them ‘The English Patient’, by Anthony Minghella in 1996. Today the Abbey functions also as a location for concerts and wedding ceremonies! 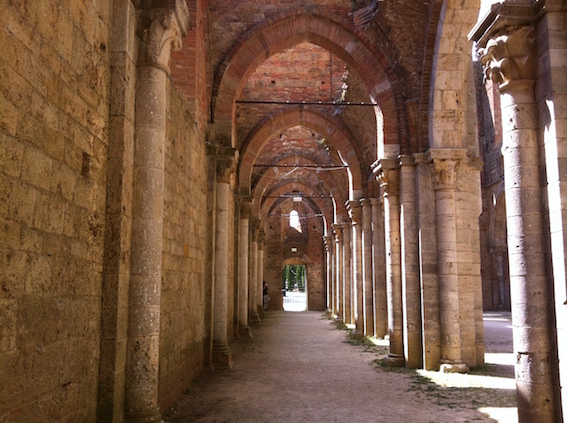 The Montesiepi Chapel and the San Galgano Abbey can be visited daily from 09.00 – 19.00. (April – October) / From 09.30 – 17.30 (November – March). Tickets: € 2,00 per person. Address: LocalitÃ San Galgano 167, 53012 Chiusdino, Siena.